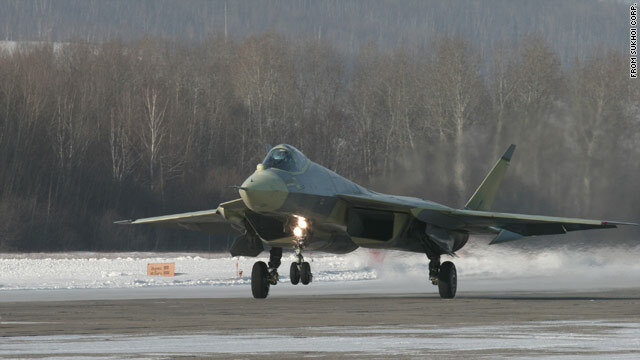 Moscow, Russia (CNN) -- Russia tested its fifth-generation Sukhoi fighter jet in the Russian Far East on Friday. The plane, provisionally called T-50, is the country's first fighter jet based on the stealth technology and is viewed by military experts as the Russian answer to the American F-35 and F-22 jets. The flight lasted for 47 minutes and was successful, being piloted by Sergei Bogdan, one of Russia's best test pilots, Sukhoi corporation spokesman Alexei Poveshchenko told CNN. Speaking to Russian TV from an airfield in Komsomolsk-on-Amur where the company has its main production facility, Sukhoi's General Director Mikhail Pogosian said, "I think this is a new stage in the development of the military aircraft industry in our country, and I believe that this is a very good start of a big work we have yet to do." According to the manufacturer, T-50 is an "intellectual" jet which can fly at any time of the day and in any weather conditions and is capable of simultaneously attacking multiple targets in air, on the ground and in the sea. The plane's other advertised features include a very high degree of maneuverability and its ability to use short airstrips. "It will also be less recognizable for radars thanks to many innovations, the use of composite materials and a special coating on the surface of the plane," a Suhkoi official told CNN on condition of anonymity. "The Americans had produced some of those technologies before us, so we're now catching up with them with this new model," he said. But independent military affairs analyst Pavel Felgenhauer believes the new plane is a "humbug" and is nothing more than a "flying prototype." "It doesn't have a new engine, modern weapons, or electronics. It's impossible to make a 5th-generation plane without having 5th-generation components," Felgenhauer told CNN. "It's just a tuned-up version of the existing Sukhoi-27 model." Another prominent defense expert, Ruslan Pukhov, Director of the Center for Analysis of Strategies and Technologies disagrees. "It is obvious that this is just a prototype and that it may take a decade before the Russian Army gets equipped with those planes. But it's still a unique technological achievement of the post-Soviet Russia which nothing else could be compared with, even the construction of the International Space Station (ISS). Unlike the ISS, this is a purely Russian project which proves that the country has been, is and will be a great aviation power," Pukhov told CNN. "Sukhoi-27, before its mass production, had been first tested with engines from earlier plane models, too. So there's no bluff," he said. The new planes, along with the modernized fourth-generation jets, will determine the Russian Air Forces' potential for decades to come, according to Sukhoil's General Director Mikhail Pogosian. Sukhoi also expects its product will become popular at the international arms market. Following Fridays's test, Russian Prime Minister Vladimir Putin said at a government meeting in Moscow that the sample quantity of the 5th-generation Sukhoi planes will be delivered to the Russian Air Forces in 2013, while their mass production will start in 2015.